The source material for Barotrauma was recorded in the Nordic fjords south of Oslo, an adjunct to Eric Holms training at the Norwegian School of Commercial diving (Norsk Yrkesdykkerskole). 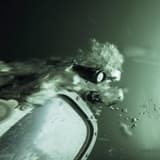 While he was training world oil prices collapsed, so left with an uncertain future Holm decided to record and film his dives, capturing the lonely calm of his isolation in the dark water. Like environments on land, the seabed is populated with machines, industry, and noise. Interference is everywhere. Engines, equipment, drilling: it is a mirror of on-land environmental exploitation. These six tracks were created over the last two years, using the sounds Holm collected from the sea floor and subsea equipment, which he then manipulated and processed, shaping a vision of his time in this underwater environment.